A few miles from CLR headquarters in New York City, in the neighborhood of Flushing, stands the John Bowne House. Bowne was a seventeenth-century English Quaker who lived in what was then the Dutch colony of New Netherlands. In 1662, he held a Quaker meeting in his home, which greatly irritated Governor Peter Stuyvesant, a strict Calvinist. When Bowne refused to pay a fine for conducting the meeting, Stuyvesant shipped him off to Amsterdam to face the colonial authorities, who sided with Bowne: the Flushing Charter protected religious liberty. Bowne returned to Flushing and has become famous, at least in these parts, as an early advocate for religious freedom. Stuyvesant was deposed two years later when the English seized New Netherlands. I recount this episode from local history because it doubtless figures in a forthcoming, interesting-looking book by Columbia history professor Evan Haefeli, New Netherland and the Dutch Origins of American Religious Liberty (University of Pennsylvania). The publisher’s description follows. 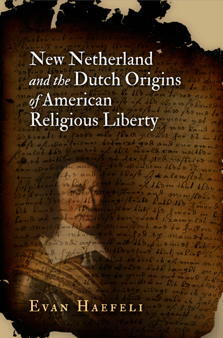 The settlers of New Netherland were obligated to uphold religious toleration as a legal right by the Dutch Republic’s founding document, the 1579 Union of Utrecht, which stated that “everyone shall remain free in religion and that no one may be persecuted or investigated because of religion.” For early American historians this statement, unique in the world at its time, lies at the root of American pluralism.